Some days are just so happy and fun! Given the upcoming festivities of the long weekend and Canada Day, I was inspired by fireworks, sprinkles and all things celebratory! I wanted this card to reflect all of these things, and have whomever open it, feel like a million sprinkles and confetti is tossed and showered over them on their special day! 1. Start with your fave embossing folder (I used Kaisercraft's Streamers folder), running some waterbased dye ink (if you use alcohol based it may stain your folder) over the raised side of the folder. 3. Run through your Big Shot, Cuttlebug or any other embossing/die cutting machine! 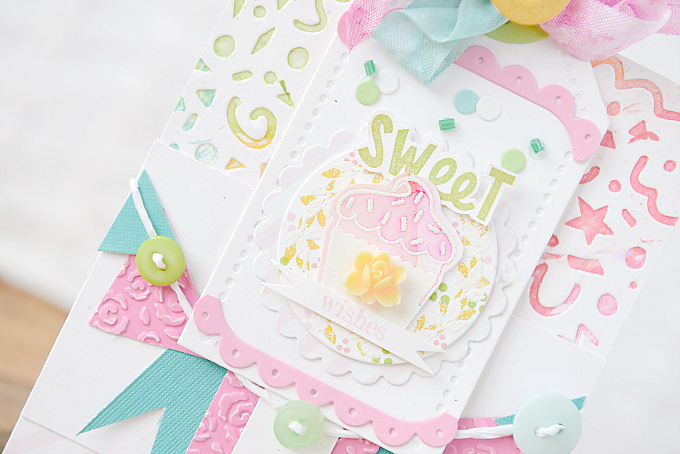 For this particular card, I used a variation of colors, to create the fun background, so go ahead and play! It only gets more fun as you experiment. Just on top of the colorful cardstock, I added a little tag from Papretrey Ink - Tag Sale #3, as well as a scallop and cirlcle from PTI's Limitless Layers. 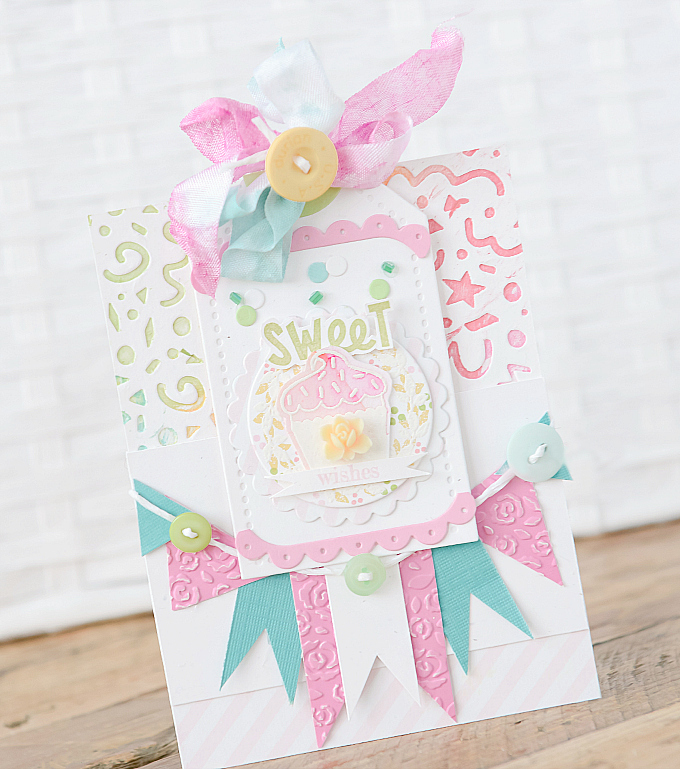 I also added little pink scallops of cardstock, cut using Papertrey's Tag Sale # 10 die. 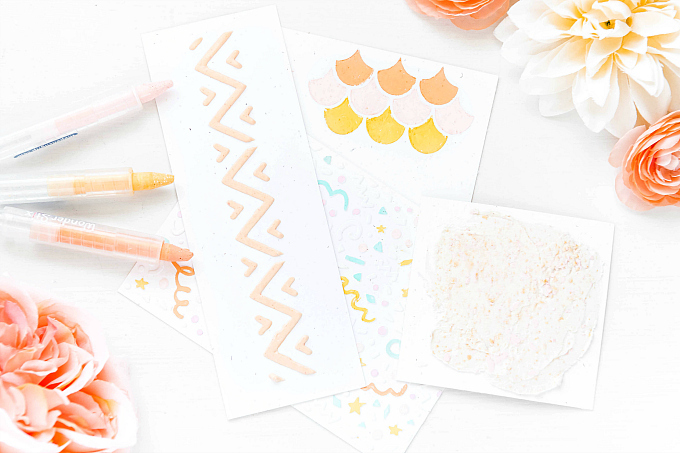 To color the little circle, I first stamped and embossed in white WPlus9's Spring Tags (the little wreath in the set), and then used my Zig Clean Color Real Brush markers to color in some happy! I did the very same thing for the cupcake, and then fussy cut it. 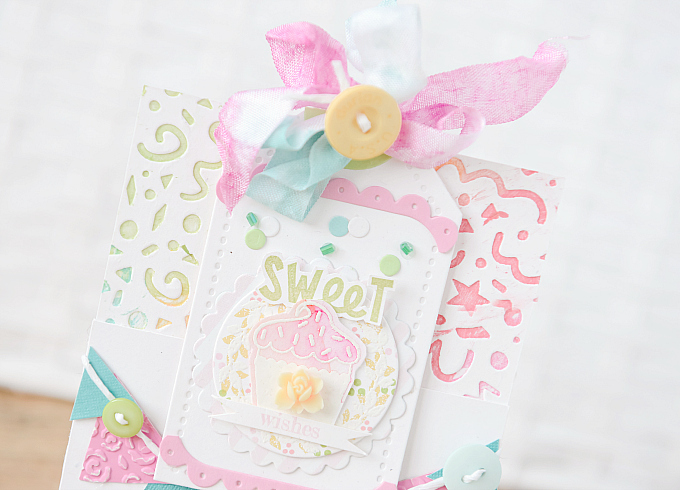 The sentiment and cupcake are from a little dollar bin stamp set - I can't quite remember the name. A few more sprinkles couldn't hurt, so I added a mix of paper confetti and glass beads just above the sentiment. I wanted to keep embossing, so I used a bit of pink cardstock with a white core (without any ink) and Kaisercraft's Little Floral folder. I love how the distressed bits came out! I freehand cut the pennant pieces - I really don't think they have to be perfect - then alternated them to create a banner, finished off with some string and buttons, and a bit of striped paper at the bottom. This card wasn't created for anyone in particular so I've added it to the shoppe! Have a great day friends and enjoy your long weekend! Happy Canada Day + Fourth of July! Love the layers and textures! This is marvelous! Gorgeous work as always Ivana! I am so glad you are crafting again! This is so pretty!! 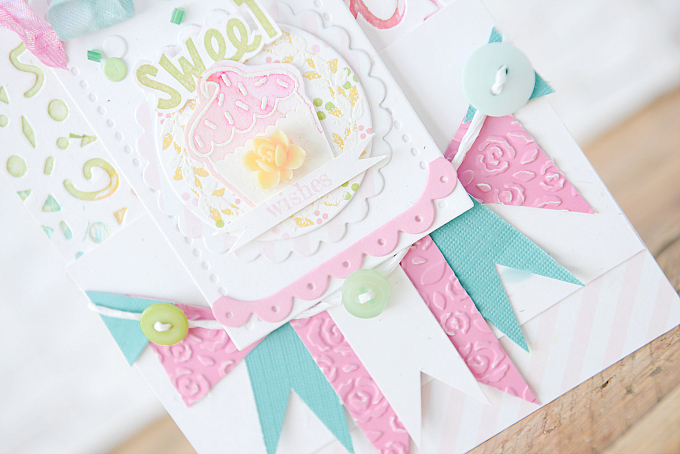 I love that layered tag, your fun background and the little banners. Great design!